ʿIṣma or Infallibility (Arabic: العِصمَة) means abstinence from sins and from disobedience to God. The belief in the infallibility of the Prophets and Imams, from intentional or unintentional sins , is a part of Shi'a creed. Infallibility from making mistakes in daily life issues –in addition to religious issues- is a matter of disagreement among scholars. Belief in the legitimacy of any religion and following its teachings precedes the substantiation of the infallibility of its prophet. In intra-faith discussions, the infallibility of the Prophets (a) in receiving and conveying the divine revelation is demonstrated through rational arguments. However, infallibility in other practical aspects of their lives is mostly demonstrated through arguments driven from authoritative texts. The word 'isma (عصمة) literally means: immunity; however it has been used in different meanings such as: chastity, preventing oneself from sins, the means for abstinence or immunity. Muslim intellectuals and scholars have presented different definitions for infallibility ('isma). The most famous of which is the definition which connects 'isma to the divine benevolence (luṭf). According to this explanation, God grants 'isma to some human beings, thereupon, they will be immune to committing sins or disregarding obligations, while they actually have the freewill and capability of committing sins. Ash'ari viewpoint: Ash'ari theologians, because of their belief in predestination (jabr) –that Human beings have no freewill (ikhtiyar) in their actions and behavior- have defined infallibility as: the state in which the sins are not created by God in one particular human being. Imamiyya and Mu'tazila viewpoint: Imamiyya and Mu'tazila theologians, based on their belief that the inherent good and evil (Ḥusn va Qubḥ) of things are known by reason and the principle of benevolence (Qa'ida al-Luṭf), have defined 'isma as: deliberate abstinence from committing sins, because of divine benevolence bestowed upon one particular person. Al-'Allama al-Hilli defines 'isma as a hidden kindness of God for His servant, which leaves no motivation in the servant for disregarding obligations or committing sins, while he/she is capable of both. Although this state seems similar to the state of piety (taqwa), it is actually much higher than taqwa, to the level that it prevents the person from committing any indecent act even as a thought and gains the person the highest levels of people's trust. The infallible person has certain physical and spiritual features and characteristics which enable him to abstain from the sins. The infallible person has complete awareness of the burdensome consequences of sins and the value of God's obedience. With continued divine revelation or inspiration, this awareness expands and becomes more profound. Not only because of disregarding obligations, the infallible will also be questioned about disregarding the recommended priorities; therefore, he knows there's no negligence or leniency about his actions and behavior (because of the heavy responsibility he bears). Knowledge and Awareness of the Consequences of Sins: some believe that infallibility is originated from a kind of intuitive knowledge about the reality of the sin and its burdensome consequences, and about the reality of acts of obedience and their pleasant results. This knowledge is so strong that the infallible vividly sees these realities and consequences; therefore, he or she never even thinks about committing sins or disregarding divine obligations. Freewill and Choice: another theory about the origin of 'isma identifies it with some kind of strong and internalized piety. This internalization is the result of repeating good deeds and continued abstinence from sins. However, this internalization is much more intensified in the state of 'isma, in comparison to the general state of piety. Repetition of correct actions requires freewill and determination, therefore, the main element in possessing the state of 'isma originates from the choice and freewill of the infallible. According to this theory, even the aforementioned intuitive knowledge about the realities of different actions and ugliness of sin is a result of this strong will and determination by the infallible. Knowledge and Will: some Muslim thinkers identify the basis of 'isma in two elements: knowledge of the facts about perfection, and strong will in acquiring perfection. For in the case of ignorance, man does not know the difference between real or delusional perfection, and in the case of weak will, man will be controlled by his selfish and carnal desires and will not reach the real perfection. A combination of natural, personal, and divine elements: some contemporary thinkers believe that 'isma does not have a single cause, rather it is the result of the combination of different elements, natural element (that is: genetic endowment, environment and family), personal element (that is: consciousness and awareness, will power and choice, intellect and internalized virtues) and the divine element which is the special divine grace for the person. The discussion about the infallibility of the prophets expands to different degrees and levels and in each level various debates have taken place among thinkers and theologians. These discussions range from immunity from polytheism (Shirk) and disbelief (Kufr) to immunity from normal mistakes. Immunity from polytheism and disbelief: there is no disagreement among different Islamic denominations and theologians with regard to the infallibility of the Prophets from polytheism (Shirk) and disbelief (Kufr). All Muslims believe that all the prophets, whether before their prophethood or after it, did not commit any form of polytheism and disbelief. Infallibility in receiving, preserving and conveying the divine revelation: main figures among Shi'a and Sunni theologians believe that the prophets are immune from sin, deliberate dishonesty or mistake, in the process of receiving, preserving and conveying the divine revelation. Upon this level of infallibility, divine prophets declare to people what has been revealed to them, without any change or alteration. Out of Divine wisdom, God chooses a person for this mission who would not commit any form of dishonesty. Infallibility in following religious practical laws: according to the famous view among Shi'a theologians, prophets are immune from deliberate sins or accidental mistakes in practicing religious obligations or avoiding religious prohibitions. Infallibility in specifying cases of different practical laws: the subject of a religious practical law is the action about which a certain religious ruling has been issued. Like prayers that has been made obligatory, and backbiting that has been prohibited. What is meant in this level of 'isma is that prophets do not commit deliberate dishonesty in recognizing the subjects, but what about accidental mistakes? For instance, is it possible for a prophet to mistakenly miss one of his prayers? Shi'a and Sunni theologians disagree over the extension of infallibility to this level. Ash'arite and Mu'tazilite thinkers believe it is possible for the Prophets to make mistakes in recognizing the subjects of religious practical laws or in their application. Among Imamiyya theologians too, al-Shaykh al-Saduq believes there's no infallibility at this level and regards the belief in prophet's Immunity from mistakes and Sahw (general negligence), as an exaggerative belief that is advocated by Ghulat and Mufawwida; however the common view among Shi'a theologians is the existence of infallibility at this level. Infallibility from mistakes in usual daily affairs: in this context, "daily affairs" are cases which, have no connection to religion per se and there is no religious law –whether obligation or prohibition- concerning them. Except for a case where such mistakes lead to public distrust, there's no rational argument in favor of the infallibility of the prophets from all mistakes in daily affairs; actually, historical reports are found in traditional collections that narrate such mistakes in the lives of the prophets. Considering the extent of infallibility of the prophets, the necessity of each level can be explained. The Infallibility pertaining to the process of revelation (receiving, preserving and conveying the revelation) is essential for the main mission of a prophet, which is conveying the divine message to public, must be guaranteed and preserved from any deliberate or accidental change and alteration. Revelation has its proper function only when it is preserved and protected from any deliberate or accidental error and distortion, from the moment it is issued, till the moment it is declared to people. Otherwise, people lose their trust and God's purpose of sending messengers and establishing religions will remain unfulfilled. Similarly, the infallibility in other areas is to guarantee the general reliability of the prophets. The absence of such reliability results in general distrust toward the main divine message and the goal of sending messengers will be ruined. Muslim thinkers have different opinions regarding the proofs of the infallibility of the prophets. An essential aspect of this discussion is that each level of 'isma requires its own specific reason. In certain levels, infallibility can be demonstrated through rational arguments –as mentioned above- in some other levels it only can be inferred from authoritative texts (verses of the Holy Qur'an or Hadith). Therefore, the proof for each level must be discussed separately. Infallibility with respect to polytheism and disbelief even before prophethood: the argument for this degree of infallibility is that a prophet's words and claims can be trusted only if they were not polytheists or unbelievers even before their prophethood. Infallibility in receiving and conveying the revelations: this degree of infallibility is demonstrated by rational arguments, because even if there is a possibility of mistakes in receiving and conveying the revelations, then that will defeat God’s purpose from sending prophets, and it is not possible for God to defeat His purpose. The Qur'an says in this regard: al-Haqqa 44-47. Infallibility in the detection of jurisprudential rulings: the argument for this is that rational persons do not trust someone who even makes unintentional mistakes; for example, they do not trust such people with their possessions and money. So, how can they trust such a person and receive their religious rulings from him? Infallibility with respect to ordinary affairs: if the mistakes at this level are not to the extent that lead to people's distrust of the prophet, then there is no rational or transmission-based argument for the impossibility of such mistakes, and if such mistakes are to the extent that lead to people's distrust, then the above rational argument will apply here as well. 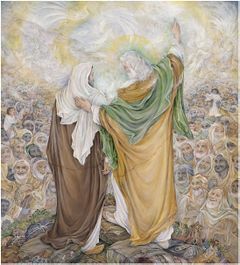 Since Imam is the successor of the Prophet (s) and the authoritative source of religious knowledge, including practical laws, spiritual teachings of the religion, exegeses of the Holy Qur'an and Sunna of the Prophet (s), he must be immune from mistakes or sins so that people can trust him and his words. Otherwise, people would lose their trust in him and God's purpose in appointing an Imam for guidance will not be fulfilled. a. He does not make mistake in religious knowledge, for he is the guide of people. b. He is infallible in his social and political decisions. Also, his decisions in scholarly leadership are perfect and correct. c. He is infallible in the application of religious practical laws, and does not make mistakes in this regard. For instance, in discerning whether a given liquid is water or wine, he does not make a mistake. Infinite Regress: according to this argument, the existence of the Imam originates from the divine benevolence; he is the guide to whom people refer to recognize the right path. If the Imam is not infallible and possibly makes errors, there must be another Imam to correct him, and if the chain does not end in infallible person, the probability of mistake and error remains. The religion brought by Prophet Muhammad (s) is supposed to remain until the Day of Judgment, as the final divine religion and practicing its laws are necessary and disregarding them is forbidden. Immunity from distortion requires the existence of one single authoritative source from which Muslims can receive correct teachings and practical laws. This ultimate authority cannot be the Holy Qur'an or the Mutawatir Sunna (numerously reported tradition of the Prophet (s)) for the Holy Qur'an contains many Mutashabih (vague and open to different or opposite interpretations) verses, there's a need for an ultimate, authoritative and trustworthy source to give the correct interpretation of these verses. Many issues have no explicit ruling in the divine scripture or the tradition of the Prophet (s). This ultimate authority cannot be the consensus of Muslims, since there are not sufficient numbers of such consensuses regarding practical laws; also, a consensus per se is not a source of religious knowledge. Qiyas (Jurisprudential analogy) cannot be the ultimate authority, for it does not have any basis in the Holy Qur'an or the Sunna of the Prophet (s). The only remaining solution is the existence of an Imam, a successor to the Prophet (s) and the ultimate authority in preserving and interpreting the religion. This individual must be infallible; otherwise the probability of alteration and distortion in religion would not reduce to zero; if such a possibility continues to exist, the purpose of sending messengers would not be fulfilled. Whether to follow him, in this case they would be an accomplice in sin and injustice, while according to the Holy Qur'an, a Muslim must refrain from such cooperation. Or to disobey his orders, which contradicts the divine command to follow the Imam and his appointment as a guide. neither of the above is possible, so Imam must be infallible. in the context of the verse, injustice includes all forms of injustice, whether about oneself or others or injustice in issues pertaining to the divine law, it also includes those who have committed injustice only once in their lives. Hereupon, a person who in not infallible has committed injustice and an unjust person cannot reach the position of Imama. 1- The conjunction used between the word 'Rasul' (Apostle) and the word 'Uli l-Amr' (those vested with authority) is 'waw' (Arabic: واو, and) which indicates that the obedience to Uli l-Amr -like the obedience to the Apostle- is unconditional. 2- Whenever God obligates unconditional obedience for a particular person, it postulates the infallibility of that person. For if that person is not infallible, he might issue wrong orders, in that case people must both obey and refuse his command. They must obey him because God has made obligatory the absolute obedience to the Uli l-Amr; similarly, they must refuse because, according to the famous and Mutawatir narration from the Prophet (s), "there's no obedience to the created (when it results) in disobedience to the Creator." Except for Shi'a, none of other Muslim sects have ever claimed the infallibility of their leaders, in fact, there's no historical evidence that anyone has ever claimed to be the addressee of this verse, or used the title "Ahl al-Bayt" except for Lady Fatima al-Zahra (a), her husband, Imam 'Ali (a) and their children. So Ahl al-Bayt (a) containing Imam 'Ali (a), Lady Fatima (a), Imam al-Hasan (a), and Imam al-Husayn (a) and other Shi'a Imams are infallible. According to this narration, the Prophet (s) directs all Muslims to have unconditional obedience to the Holy Qur'an and his household. Unconditional obedience postulates infallibility, for it is impossible for God and his Apostle to introduce a fallible person, who might make mistakes and contradict the Holy Qur'an and the Sunna of the Prophet (s), as the guide for people. In this narration the inseparability between the Holy Qur'an and the Ahl al-Bayt (a) has been emphasized. Committing a sin or making a mistake means separation from the Holy Qur'an, while the Prophet (s) has confirmed the inseparable bound between the two, until the Day of Judgment. - In this Hadith, the Holy Qur'an and the Ahl al-Bayt (a) are introduced as the guides who save their followers from deviation; this function is only possible when the Ahl al-Bayt (a) are infallible and immune from sins and mistakes. "Ali is with the truth and truth is with Ali"
'Abd al-Rahman b. Abi Sa'd has narrated from his father: we were sitting in a group of Muhajirun and Ansar near the house of the Prophet (s) when 'Ali (a) came. The Apostle of Allah (s) asked: do you want me to introduce to you the best among you? "Yes" they replied. The Prophet (s) said: 'the best among you are those who keep their covenant and use perfume. Allah likes the pious servants.' At this very moment 'Ali b. Abi Talib (a) passed by us, the Apostle of Allah (s) said: he is with the truth and truth is with him. This Hadith is explicitly stating the infallibility of Imam 'Ali (a), for infallibility means nothing but the continual companionship with the truth and righteousness, and immunity from mistakes and sins in words and deeds. The Apostle of Allah (s) testifies that Imam 'Ali (a) is always and in all situations with the truth and never separates from the truth. With this testimony, the absolute infallibility of Imam 'Ali (a) from any sin or mistake is demonstrated, for the actions and words of a fallible person are not always associated with the truth. So the belief in the infallibility of Imam 'Ali (a) is necessary; otherwise it entails the rejection of the testimony of the Prophet of Islam (s). The Prophet of Islam (s) said: whoever wishes to look at the red ruby stick which Allah has planted with His hands and hold onto it, he should have the Wilaya of 'Ali and the Imams from his progeny, for they are the chosen ones by Allah and the pure ones and the infallibles from all sins and mistakes. This Hadith explicitly states the infallibility of Shi'a Imams. ... over which (fire) are [assigned] angels, severe and mighty, who do not disobey whatever God has commanded them, and carry out what they are commanded. Angels are beings that are pure from any form of disobedience and sin. However, based on the general definition of 'isma, the term is accurately used for beings that have freewill and ability to disobey God's commands, but refrain from committing sins, and supported by the divine benevolence, they are immune to mistakes which entail mistrust. According to this definition, while angels are pure from disobedience, they do not have the position of 'isma in the proper sense of the term. However in the extended application of the term, i.e. purity from sins and mistakes (whether out of freewill or by nature) angels are infallible as well, since they have no tendency toward sins. They are engaged in everlasting glorification and praise of God and always obey divine commands. ↑ Fayyūmī, al-Miṣbāḥ al-munīr, under the word "عصم". ↑ Dihkhudā, Lughatnāmih, under the word "عصمت". ↑ Ibn Manẓūr, Lisān al-ʿArab, under the word "عصم". ↑ Sharīf al-Murtaḍā, Rasāʾil al-sharīf al-Murtaḍā, p. 326. ↑ Iījī, Sharh al-mawāqif, p. 280. ↑ Ḥillī, al-Bāb al-ḥādī ʿashar, p. 9. ↑ Subḥānī, Muḥāḍirāt fī l-ilāhīyāt, p. 276. ↑ Motahari, Majmūʿih āthār-i ustād shahīd Motahari, vol. 2, p. 158. ↑ Ḥillī, Kashf al-murād, p. 494. ↑ Riy Shahrī, Falsafih-yi waḥy wa nubuwwat, p. 210. ↑ Riy Shahrī, Falsafih-yi waḥy wa nubuwwat, p. 215. ↑ See: Miṣbāḥ Yazdī, Rāh wa rāhnamāshināsī, p. 302. ↑ Qadrdān Qarāmalikī, Kalām-i falsafī, p. 388-390. ↑ Taftāzānī, Sharḥ al-maqāṣid, vol. 5, p. 50. ↑ Iījī, Sharh al-mawāqif, p. 263. ↑ Mufīd, al-Nukat al-iʿtiqādīyya, p. 37; Ḥillī, Kashf al-murād, p. 394. ↑ Ṣadūq, Man lā yaḥḍiruh al-faqīh, vol. 1, p. 360. ↑ Mufīd, ʿAdam sahw al-nabī, p. 29 & 30. ↑ Miṣbāḥ Yazdī, Āmūzish-i ʿaqāyid, p. 193-194. ↑ Sharīf al-Murtaḍā, al-Shāfī fī l-imāma, vol. 1, p. 289 & 290. ↑ Baḥrānī, Qwāʿid al-marām fī ʿilm al-kalām, p. 178-179. ↑ Khājih Naṣīr al-Dīn al-Ṭūsī, Tajrīd al-iʿtiqād, p. 222; Taftāzānī, Sharḥ al-maqāṣid, vol. 5, p. 50. ↑ Sharīf al-Murtaḍā, al-Shāfī fī l-imāma, vol. 3, p. 141. ↑ Muẓaffar, Dalāʾil al-ṣidq, vol. 2, p. 17. ↑ Ṭabarsī, Majmaʿ al-bayān, vol. 2, p. 64. ↑ Ṭabāṭabāʾī, al-Mīzān, vol. 16, p. 310-312. ↑ Ibn Ḥanbal, Musnad al-imām Aḥmad ibn Ḥanbal, vol. 17, p. 309. ↑ Abū Yaʿlā, Musnad Abī Yʿlā, vol. 2, p. 318; ʿAsqalānī, al-Maṭālib al-ʿālīya, vol. 16, p. 147. ↑ Ṣadūq, ʿUyūn akhbār al-riḍā, vol. 2, p. 57. ↑ Makārim Shīrāzī, Tafsīr-i nimūnih, vol. 17, p. 304. Abū Yaʿlā, Aḥmad b. ʿAlī. Musnad Abī Yʿlā. Edited by Ḥusayn Salīm Asad. Damascus: Dār al-Maʾmūn li-l-Turāth, 1404 AH. ʿAsqalānī, Aḥmad b. ʿAlī al-. Al-Maṭālib al-ʿālīya bi-zawāʾid al-masānīd al-thamānīyya. Edited by Saʿd b. Naṣr. Riyadh: Dār al-ʿĀṣima li-l-Nashr wa al-Tawzīʿ, 1420 AH. Baḥrānī, Maytham b. ʿAlī al-. Qwāʿid al-marām fī ʿilm al-kalām. Edited by Aḥmad Ḥusaynī Ishkiwarī. Qom: Maktabat Āyat Allāh al-Marʿashī al-Najafī, 1406 AH. Dihkhudā, ʿAlī Akbar. Lughatnāmih. Tehran: Dānishgāh-i Tehran, 1339 Sh. Fayyūmī, Aḥmad b. Muḥammad al-. Al-Miṣbāḥ al-munīr. Qom: Dār al-Hijra, 1414 AH. Ḥillī, al-Ḥasan b. Yūsuf al-. Al-Bāb al-ḥādī ʿashar. Tehran: Muʾassisi-yi Muṭāliʿāt-i Islāmī, 1365 Sh. Ḥillī, al-Ḥasan b. Yūsuf al-. Kashf al-murād. Fourth edition. Qom: Muʾassisi-yi Nashr-i Islāmī, 1413 AH. Ibn Ḥanbal. Musnad al-imām Aḥmad ibn Ḥanbal. Edited by Shuʿayb al-Arnūṭ. Beirut: Muʿassisat al-Risāla, 1421 AH. Ibn Manẓūr, Muḥammad b. Mukrim. Lisān al-ʿArab. Edited by Mīrdāmādī. Beirut: Dār al-Fikr, 1414 AH. Iījī, Mīr Sayyid Sharīf al-. Sharh al-mawāqif. Qom: al-Sharīf al-Raḍī, 1325 Sh. Khājih Naṣīr al-Dīn al-Ṭūsī, Muḥammad b. ʿAlī al-. Tajrīd al-iʿtiqād. Edited by Muḥammad Jawād Ḥusaynī Jalālī. Tehran: Maktab al-Aʿlām al-Islāmī, n.d.
Makārim Shīrāzī, Nāṣir. Tafsīr-i nimūnih. Tehran: Dār al-Kutub al-Islāmī, 1374 Sh. Miṣbāḥ Yazdī, Muḥammad Taqī. Āmūzish-i ʿaqāyid. Eighteenth edition. Tehran: Shirkat-i Chāp wa Nashr-i Bayn-al-milal, 1384 Sh. Miṣbāḥ Yazdī, Muḥammad Taqī. Rāh wa rāhnima shināsī. Qom: Intishārāt-i Muʾassisiy-i Āmūzishī Pazhūhishī Imām Khomeini, 1395 Sh. Motahari, Murtaḍā. Majmūʿih āthār-i ustād shahīd Motahari. Tehran: Ṣadrā, 1390 Sh. Mufīd, Muḥammad b. Muḥammad al-. ʿAdam sahw al-nabī. Edited by Mahdī Najaf. Qom: al-Muʾtamar al-ʿĀlamī li-Alfīyat al-Shaykh al-Mufīd, n.d.
Mufīd, Muḥammad b. Muḥammad al-. Al-Nukat al-iʿtiqādīyya. Qom: al-Muʾtamar al-ʿĀlamī li-Alfīyat al-Shaykh al-Mufīd, 1413 AH. Muẓaffar, Muḥammad Ḥasan. Dalāʾil al-ṣidq. Qom: Muʾassisat Āl al-Bayt li-Iḥyāʾ al-Turāth, n.d.
Qadrdān Qarāmalikī, Muḥammad Ḥasan. Kalām-i falsafī. Qom: Wuthūq, 1383 Sh. Riy Shahrī, Muḥammad. Falsafih-yi waḥy wa nubuwwat. Qom: Intishārāt-i Daftar-i Tablīghāt, 1363 Sh. Ṣadūq, Muḥammad b. ʿAlī al-. Man lā yaḥḍiruh al-faqīh. Second edition. Qom: Jāmiʿat al-mudarrisīn, 1404 AH. Ṣadūq, Muḥammad b. ʿAlī al-. ʿUyūn akhbār al-Riḍā. Edited by al-Shaykh Ḥusayn al-Aʿlamī. Beirut: Muʿassisat al-Aʿlamī li-l-Maṭbūʿāt, 1404 AH. Miṣbāḥ Yazdī, Muḥammad Taqī. Rāh wa rāhnamāshināsī. Qom: Intishārāt-i Muʾassisi-yi Āmūzishī wa Pazhūhishī-yi Imām Khomeini, 1395 Sh. Sharīf al-Murtaḍā, ʿAlī b. al-Ḥusayn al-. Tanzīh al-anbīyaʾ. Qom: al-Intishārāt al-Sharīf al-Murtaḍā, 1376 Sh. Sharīf al-Murtaḍā, ʿAlī b. al-Ḥusayn al-. Al-Shāfī fī l-imāma. Tehran: Muʾassisat al-Ṣādiq, 1407 AH. Sharīf al-Murtaḍā, ʿAlī b. al-Ḥusayn al-. Rasāʾil al-sharīf al-Murtaḍā. Qom: Dār al-Kutub, 1405 AH. Subḥānī, Jaʿfar. Muḥāḍirāt fī l-ilāhīyāt. Edited by ʿAlī Rabbānī. Qom: Muʾassisi-yi Imām Ṣādiq (a), 1428 AH. Ṭabarsī, Faḍl b. al-Ḥasan al-. Majmaʿ al-bayān. Beirut: Dār Iḥyāʾ al-Turāth al-ʿArabī, n.d.
Ṭabāṭabāʾī, Muḥmmad Ḥusayn al-. Al-Mīzān fī tafsīr al-Qurʾān. Qom: Nashr-i Islāmī, 1417 AH. Taftāzānī, Masʿūd b. ʿUmar al-. Sharḥ al-maqāṣid. Edited by ʿAbd al-Raḥmān ʿUmayra. Qom: al-Shrīf al-Raḍī, 1412 AH. This page has been accessed 15,932 times.